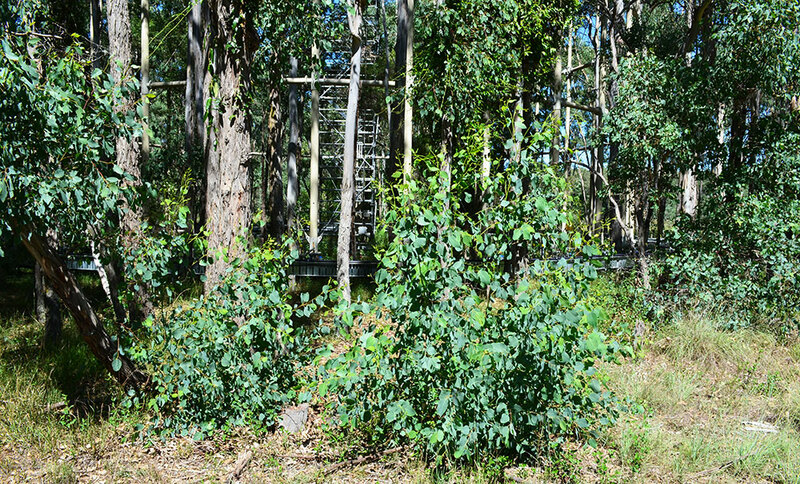 The incredibly dry Spring and early Summer period coincided with the end of the first twelve months' of operations at the incredible EucFACE experiment. The forest ecosystem was so dry that the Red Gums shed their leaves in large quantities and the soil reached moisture levels of just a few percent. December rains replenished the soil and the trees have literally burst into life, the grasses are growing again and the forest has bloomed in front of us. We measure the area of the leaves and it's quite clear that the canopy has thickened with new growth above us. We have been able to record the almost immediate response of the soil to that early December rainfall using hundreds of sensors and recorders placed through the Cumberland Plain Forest. What we saw was an immediate 'breathing out' from the soil as revived soil flora and fauna became active again after the rain. We were able to measure this and plot the 'breathing' on graphs that coincide with the rainfall. It's a beautiful example, and a testament to the value of our infrastructure, of how EucFACE and surrounding devices can quantify the natural, ongoing processes of our natural world.